CIPLA closed the week on negative note losing around 1.40%. As we have mentioned last week that minor resistance for the stock lies in the zone of 595 to 600. Resistance for the stock lies in the zone of 610 to 615 where 500 Daily SMA is lying. 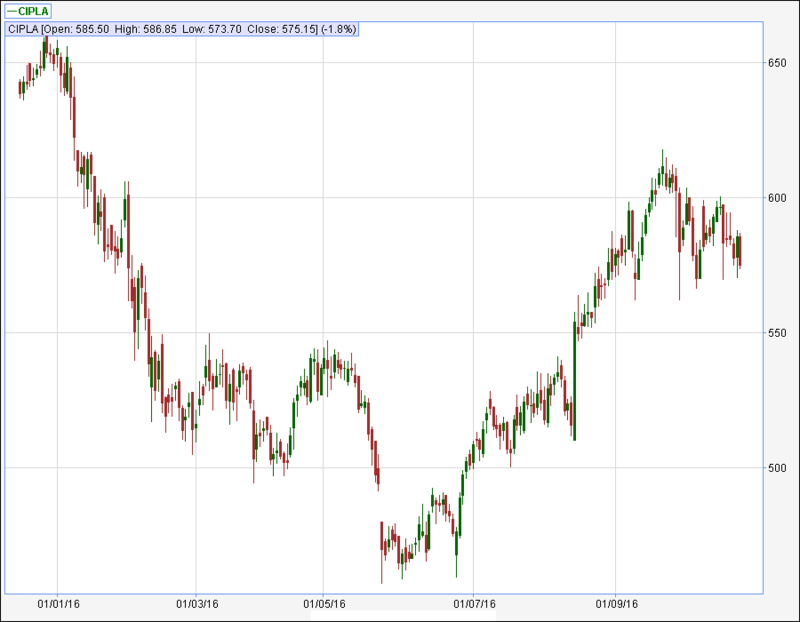 If the stock manages to close above these levels then the stock can move to the levels of 650 to 660 from where the stock has sold off in the month of December – 2015. During the week the stock manages to hit a high of 595 and close the week around the levels of 575. Support for the stock lies in the zone of 568 to 572 where short term moving averages are lying. If the stock manages to close below these levels then the stock can drift to the levels of 545 to 550 from where the stock broken out of the double top pattern and 200 Daily SMA is lying. Minor resistance for the stock lies in the zone of 580 to 585. Resistance for the stock lies in the zone of 595 to 600 from where the stock has retraced couple of times in the month of October – 2016. If the stock manages to close above these levels then the stock can move to the levels of 610 to 615 where the stock has formed a top in the month of September – 2016. Broad range for the stock is seen in the range of 555 – 560 on downside to 600 – 605 on upside.